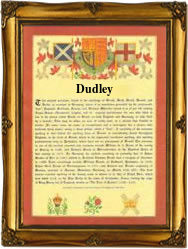 This name is of Anglo-Saxon origin, and is locational from a place thus called in Worcestershire, recorded as "Dudelei" in the Domesday Book of 1086, and as "Duddele" in the 1221 Assize Court Rolls of that county, the place was so called from the Olde English pre 7th Century personal byname "Dudda" from a Germanic root used to describe a rotund or heavily built man, plus the Olde English "leah", a wood or clearing; hence, "Dudda's leah". The surname first appears on record in the latter part of the 12th Century (see below). Other early recordings include Herbert de Dudeleg (Worcestershire, 1225), and Willelmus Dudely, Johannes Dudly and Magota Duddely, in the Poll Tax Returns of Yorkshire (1379). Among the several notable namebearers mentioned in "The Dictionary of National Biography" are Ambrose Dudley, (1528 - 1590), Earl of Warwick, 1561, D.C.L. Oxford, 1566, and Lady Jane Dudley, (1537 - 1554), better known as Lady Jane Grey, who reigned for nine days in 1553. The first recorded spelling of the family name is shown to be that of Gladdewin de Duddeleia, which was dated 1176, in the "Pipe Rolls of Staffordshire", during the reign of King Henry 11, known as "The Builder of Churches", 1154 - 1189. Surnames became necessary when governments introduced personal taxation. In England this was known as Poll Tax. Throughout the centuries, surnames in every country have continued to "develop" often leading to astonishing variants of the original spelling.